Doesn't look like it is available. Maybe post your request on the Chinese forum, that is where all the skin designers are. Is this normal? I'm using the Socool theme on Maxthon 4.4.3.4000. The tools on the top right just have different colored boxes instead of the tool picture. Thank you. Nice theme though, thank you! 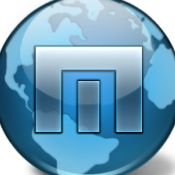 Skin isn't updated to work with newest/ current Maxthon builds. Ok, thank you. I did not know that. Everything else works pretty good though except for that.